The SLAM is back after a brief hiatus, and because this slam will be held in February, when we all need a little more light because of the dark winter months, the theme of the SLAM will be light or dark. To compete: Bring 3 poems that are about light or dark. All regular SLAM rules apply. 3-minute limit per poem. SLAM is a spoken word competition where the brave, bright and loud get on stage to share their words in front of a hollering, cheering, supportive crowd. At the end of the night a poet is selected as the reigning word warrior and immortalized in name on the one and only SLAM medallion. The top 3 poets go home with a cash share of the door! All ages are welcome, all skill levels are encouraged. Come compete or come enjoy. Everyone is welcome. Be there! Details for competing performers: A SLAM is carried out in a series of rounds. How many rounds we have will depend on how many people participate up to a maximum of 12 poets. If you want to perform, have at least three poems ready that are under three minutes each. You are docked points over three minutes. Poems do NOT have to be memorized, but it is encouraged. So get writing! Spit hot fire! 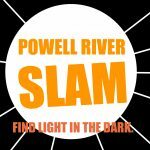 You can register to compete by emailing powellriverpoetryslam@gmail.com or you can sign up at the event between 5:15-5:45 pm.